Herd Health Day went great. Everyone, except maybe the sheep and alpacas, had a wonderful time! The critters were, shall we say, reluctant participants. Shareholders Laurie, Chris and Linda joined us for the day, pitching in and generally making themselves quite useful. It was kind of an experiment to see how much of my to-do list was actually realistic. All in all, I was very happy with how much we accomplished. 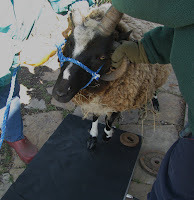 We started in the sheep pens, haltering each sheep and bringing them to the walkway where I had set up the scale. 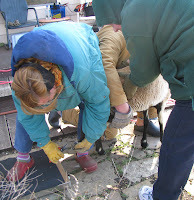 It took nearly everyone to keep the sheep centered on the scale without leaning on one of us, to get a good reading. Chris has lab experience, so she was a whiz at the scale and at recording the final numbers. Now I have actual weights recorded for each sheep. Trimming nails went pretty well, though I did get a little close on one of Zacchaeus' nails. My trimmers weren't quite as sharp as they might have been, so next time, I'll need to have them sharpened - and maybe even a spare pair at the ready. It's clear we need more halter time with the sheep to keep them easy to manage. About this time, it was dawning on me that we probably don't need to trim nails every month. I've pushed that back to a schedule where once a quarter I'll look at them, but probably twice a year trimming will be plenty. It is good to keep up with their weights quarterly too, just to make sure all is well under all that fleece. I also need to pick a day when the wind isn't blowing 30 mph with an ambient temperature of 48 degrees. That is against the Geneva Convention, I think. We were all beat to a pulp before we finished. After the sheep, we needed a break, so thanks to Shareholder Laurie, we all repaired to the Red Barn studio for another award-winnng quiche, cookies, and coffee. Somebody mentioned something about writing a Jacob's Reward Farm Cookbook. Hmm.... But then it was back up and out to the alpaca barn, where, mercifully, the wind was not very strong at all. 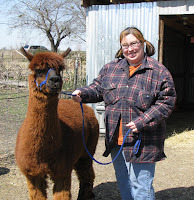 The alpacas were all haltered and body scored (they feel great to me - not thin this year!) and we trimmed Moonstruck's toenails. Unfortunately, the trimmers were getting almost dull at this point, even with Ted taking a turn with them, and we decided to forgo the rest of the toes until such time as sharp trimmers may be procured. 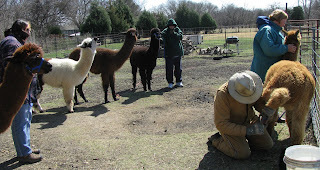 But Chris and Linda did a fantastic job holding and walking the alpacas on their lead ropes. Laurie gets credit for all the photos, because my camera never left my coat pocket! It was clear the scale isn't big enough to get all four alpaca feet on it, so we'll have to rig a platform for it, to increase its square footage. So, no weights on the 'pacas today. That will give us something to do next time. 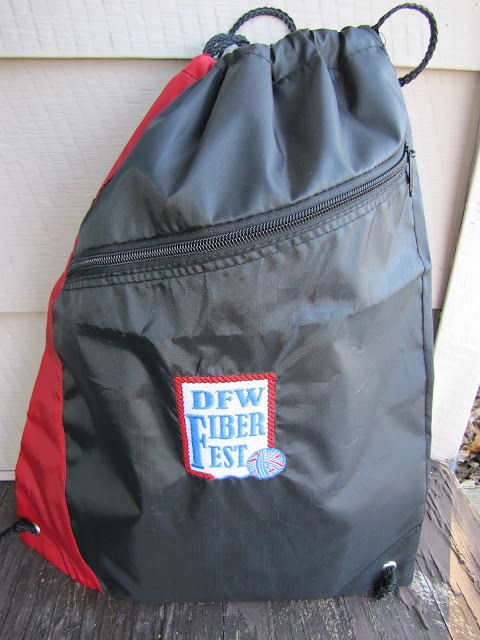 I'm really stiff and sore from all the bending and the squeezing of those clippers. But it's that good kind of stiff and sore that lets you know you've had a very productive day outside in the fresh air and sunshine. And gale force wind. Thanks again to friends Linda, Chris, and Laurie, for coming out and really lending a loving hand, and a special thanks to husband Ted, who, from time to time, participates with an unexpected enthusiasm and much needed talent. I had SUCH a fantastic time! And next time we should make lunch a potluck or something . . . I came home and babbled to Hub about sheep and alpacas and chickens and little red barns and quiche for hours. Sounds like in spite of the weather, all went well! Great job. I give you bonus points for being out in that wind, I bet your face was windburned and it was quite a beating! Take care, and glad to hear the herd is healthy and all is well. Are You Cool Enough for CSA?